Still, these boilerplate possibilities are not always satisfactory. Like など, the phrase を中心に points vaguely offstage at unspecified others, and does not necessarily add anything when translated literally. Take a look at ヨーロッパでは南部や東部を中心に記録的な猛暑が続いている. 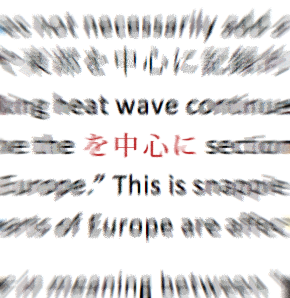 One way to translate this would be “A record-breaking heat wave continues in Europe, particularly in the south and east.” Alternatively, we could remove the を中心に section to get “A record-breaking heat wave continues in Southern and Eastern Europe.” This is snappier and conveys much the same information, as readers would assume other parts of Europe are affected too. Similarly, there is not a great deal of difference in meaning between “popular with women” and “particularly popular with women,” or “held a discussion focused on research issues” and “discussed research issues.” It is a judgement call as to whether the greater precision justifies the extra words or vice versa. Sometimes it does and sometimes it doesn’t, and I would take into account how straightforward the surrounding text is in making my decision. This addresses を中心に in a commonly encountered generic form, but there are other possibilities too. One word to consider is “specialise” for someone’s activities or a shop’s products. Send your feedback, mainly about the Word Wise column, by dropping a line to SWET or commenting on the Facebook page.